Magic Choc is a product I first saw at the Amazon Christmas preview and loved the idea of. It’s basically chocolate you can play with like play doh, make little models, then eat the results. If you’re good at modelling, you could produce something like the models shown here. If not…well…you’ll see. Each Magic Choc Starter Pack contains 120g of chocolate in total: 60g of milk chocolate, 40g white chocolate and 20g dark chocolate. You also get an anti-bacterial hand wipe and a leaflet with ideas. It would be great for a craft party at home – one pack between two children is enough (you could probably stretch it to three for smaller children). The little medallions of chocolate are quite hard at first – like plasticine that’s been left out in the air for too long. I had to hold it in my hands to soften it up a bit before passing it over to the children for modelling. It doesn’t melt in your hand – it just goes a bit oily and pliable. The models they made weren’t quite like the ones on the box, but we tried. 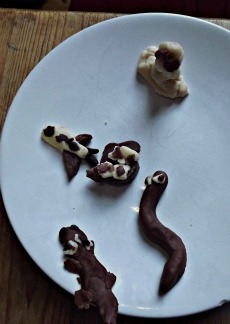 My children were not keen on the taste of Magic Choc at first, and reckoned it tasted “like chocolate that’s gone off”. But that didn’t stop them eating every scrap, and licking my hand after I’d been moulding it. I wasn’t wild about the taste either, but I still like the product as I think it’s more about the fun factor than anything else. We had lots of fun playing with this. 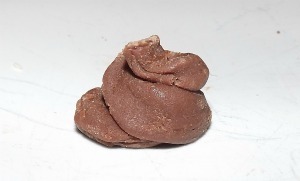 Oh excuse me, I am reliably informed that that’s actually “a turdlet”, a mini version of the real thing. Which you can eat, if you’re deranged. My family are deranged, it’s official. Thank you Magic Choc for proving what I have known all along.